What's the one thing you'd want to save if you knew your computer was going to crash? Your pictures! Picture Keeper provides peace of mind for your irreplaceable photos. Picture Keeper solves the problem of backing up your photos with a solution that is fast and simple. Picture Keeper drives feature our built-in backup software - all you have to do is plug the Picture Keeper pro USB cable in and click "start backup". 1. Picture Keeper automatically finds and saves your photos into one convenient location. 2. The initial backup will find all of your pictures and it even skips duplicates. 3. During backup, watch your pictures fly by on the screen, a virtual trip down memory lane. 4. Once your backup is complete, future backups will only save newly added pictures. 5. Even better, when one Picture Keeper fills up, the next one picks up where the last left off. New features: select/tag your favorite photos to share or print. Easily share photos via Facebook or email. Print photos at home. Backup photos from Facebook. We make it easy to use your photos: share photos via Facebook or email. Make copies of your photo library. View on digital frames and TVS with USB ports. Load your photos onto a new computer. Restore photos after a computer crash. 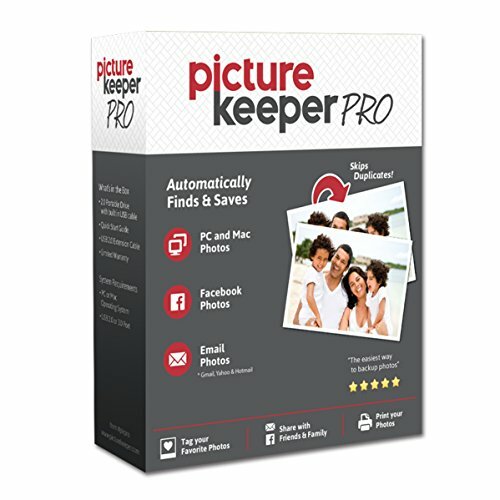 The Picture Keeper difference: no software to install, no wires to connect, no passwords or monthly fees. Just plug Picture Keeper in and click "start backup" multiple sizes Picture Keeper drives are available. Our drives are PC and MAC compatible. You can use it on multiple computers. It can find and save videos clips too. Free software updates for registered users. Capacity estimate based on average size of 2mb per picture: pro 500 edition holds 250,000 photos on average. Packaging may vary. Once the app is installed - Just click "Start Backup," and relax as it does the work for you! Use on multiple computers - software knows where each backup left off. Once one Picture Keeper fills up, just plug in the second one and it continues where the other left off! If you have any questions about this product by Picture Keeper, contact us by completing and submitting the form below. If you are looking for a specif part number, please include it with your message.